Very often comes the time when you need to debug your applications. We all use PowerShell, but it is unproductive to repeat long commands, so we built a tool that saves your time. All you have to do is to launch Hover from the shortcut created by our installer, then from its GUI select form the list of apps the target app container and from the right side pane double click the program you want to launch in the container. You can also add new programs to that list, we've just included a predefined list for the most used. P.S. 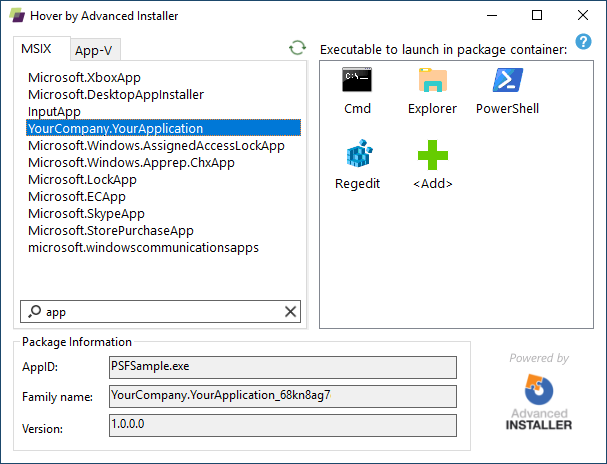 Advanced Installer can be easily used to edit and create MSIX and App-V packages. You can download the tool for free from our Tools page. For any questions, suggestions or bug reports please contact our support team at support at advancedinstaller dot com or on our public forums.